Manager Turlough O’Brien, midfielder Brendan Murphy and coach Steven Poacher have been hit with lengthy suspensions. Turlough O'Brien, Brendan Murphy and Steven Poacher. 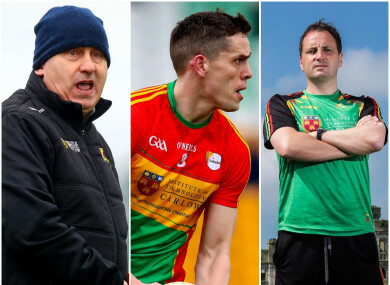 THE GAA’S CENTRAL Hearings Committee (CHC) have imposed lengthy suspensions on Carlow’s Turlough O’Brien, Brendan Murphy and Stephen Poacher for using “threatening conduct towards a referee” at end of their league defeat to Down last month. Manager O’Brien has been hit with a 20-week ban, while coach Poacher and midfielder Murphy have both received 12-week suspensions. As first reported by The42 last week, it relates to an incident at the end of Carlow’s round 6 Division 3 game against Down on 16 March when referee James Bermingham was confronted after the full-time whistle. All three have the option of appealing the CHC decision to the Central Appeals Committee (CAC). The alleged infraction of “minor physical interference with a referee” was not proven in all three cases. If the bans are accepted they will have major repercussions for Carlow’s championship campaign. Murphy has been one of their leading players over the last decade while O’Brien and Poacher guided them to promotion from Division 4 and the Leinster semi-final in 2018. Meanwhile, no penalty will be imposed on Monaghan defender Fintan Kelly who received a red card against Mayo on 24 March. The alleged infraction of ”striking with an elbow” found not proven by the CHC and his record will be amended accordingly. Email “20-week and 12-week bans handed out to Carlow trio after this incident with referee”. Feedback on “20-week and 12-week bans handed out to Carlow trio after this incident with referee”.